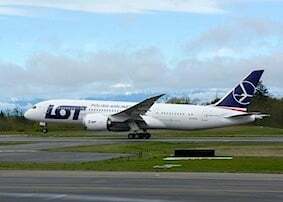 Boeing completed a B787 Dreamliner certification demonstration flight on Friday on a Boeing-owned production airplane built for LOT Polish Airlines. The flight marks the final certification test for the new battery system, completing the testing required by the US Federal Aviation Administration. Meanwhile, airlines are scheduling the return of Dreamliner flights. Boeing said: “The crew reported that the certification demonstration plan was straightforward and the flight was uneventful. The purpose of the flight was to demonstrate that the new battery system performs as intended during normal and non-normal flight conditions. United plans to resume B787 flights on 31st on its Houston to Denver route and the Dreamliner is planned to make its debut on the London Heathrow – Houston route from 10th June 10. Qatar Airways plans to resume Dreamliner flights, “subject to change”, from Doha to London Heathrow from 15th May 15, followed by B787 services to Munich, Frankfurt and Zurich in late May and early June.